SIDE 8 is the eighth in a series of biennial conferences devoted to Symmetries and Integrability of Difference Equations and related topics: ordinary and partial difference equations, analytic difference equations, orthogonal polynomials and special functions, symmetries and reductions, difference geometry, integrable discrete systems on graphs, integrable dynamical mappings, discrete Painlevé equations, singularity confinement, algebraic entropy, complexity and growth of multivalued mapping, representations of affine Weyl groups, quantum mappings and quantum field theory on the space-time lattice. 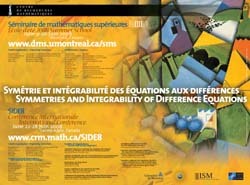 SIDE1 took place in Estérel, in Québec, Canada, May 22-29, 1994. The event was so successful that it gave rise to the series since held in the United Kingdom, Italy, Japan, France, Finland, Germany, and Australia. (the Laurentian area near Montréal), from June 22, 2008 (arrival day) to June 28, 2008 in the afternoon (departure day).